In Seattle, home prices grew 10.3 percent in September to a new median of $630,000, mirroring a similar trend for the suburbs in King County. September marked the third straight month in which King County single-family home prices declined from their all-time peak reached at the end of the spring. Prices are typically lower this time of year. Buyers pummeled by the red-hot market seen earlier in the year might take what they can get at this point. In Seattle, the annual increase in home prices has begun to level off and now represents half the explosive growth rate seen at the beginning of the year. 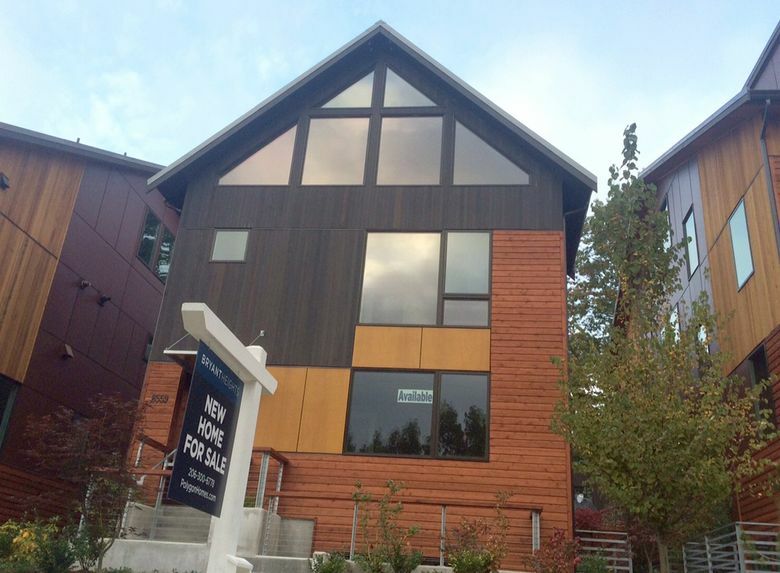 The typical Seattle house now costs $630,000, up 10.3 percent from a year ago. 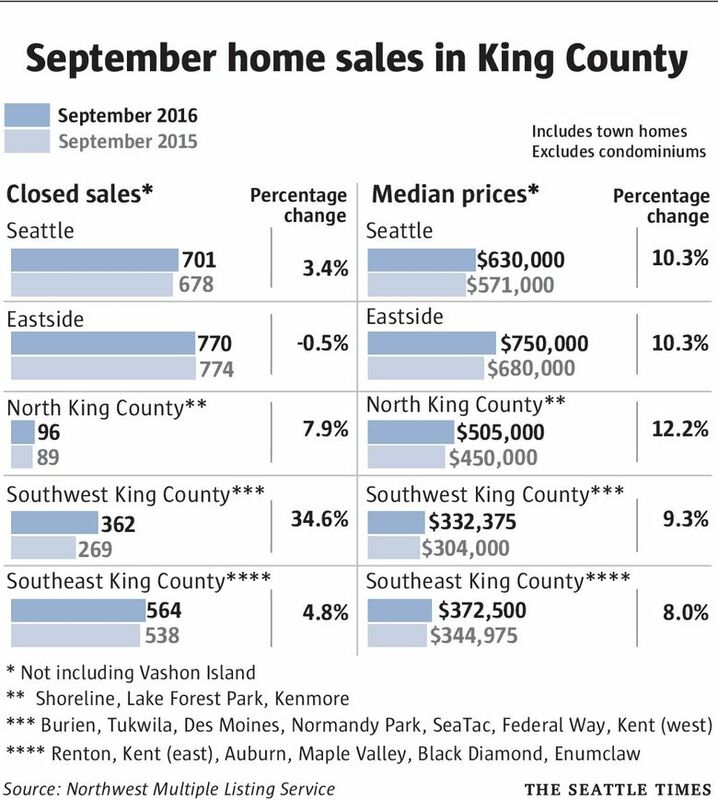 A similar trend of relatively slower growth is reaching suburbs around King County, as well: Prices on the Eastside also grew 10.3 percent from a year ago, hitting $750,000, down from the record prices and higher growth rates seen earlier in the year. Although this month’s data presented a muddled picture on prices, the change in inventory was clearly positive. For the first time in the last few years, additional homes in significant number are finally starting to come back on the market for sale. The number of houses for sale in the county is now at its highest point in two years, although it still has a long way to go to get back to “normal” inventory levels. That could help contain the recent bidding wars and price spikes triggered by the historically low supply of homes for sale. But it doesn’t seem to be helping much yet. “I have definitely noticed that my buyers have more to choose from, but what it feels like to me is that the buyer pool has been so large, and ever growing, that the increase in inventory has not eased the demand issue,” said Redfin agent Kyle Moss. Still, he said, buyers may have the chance to be choosier. That would be a welcome change to home seekers who keep reporting that it’s taken several months, and multiple failed bids, to get a home. Alyson Andrews and her longtime boyfriend, Gerard, visited about 100 homes over 10 months after deciding to move out of their Green Lake rental. First, they realized the market was “too crazy” to buy in Seattle. Then, after settling on Shoreline, they lost four houses in bidding wars, even after agreeing to go $100,000 above the asking price. “It was just mind-blowing,” said Andrews, 28, who eventually got a house in Shoreline for about $520,000. “You go there and there are 15 other people touring it,” she said. “I had no idea it was this crazy of a market, and this competitive, and that half a million dollars can’t get you a decent” house. Renters aren’t seeing any relief, either. Rents continue to rise at a similar pace as home costs, and are now up 9.3 percent across the Greater Seattle area compared to a year ago, according to a new Dupre + Scott Apartment Advisors report. That’s similar to the increase reported in each of the last two years, and puts Seattle among the fastest-growing rental markets in the country. The typical two-bedroom, two-bath unit across King County costs about $1,870 a month — $570 more than five years ago. The current average rent varies wildly from about $1,160 in Enumclaw to $3,110 in downtown Seattle. Rents are still climbing despite about 10,000 new apartments opening in each of the last two years across King, Snohomish and Pierce counties — the most since 1990, Dupre + Scott said. But the firm forecasts an even greater number of apartments to open next year, which might help slow down the rising rents. September marked the second full month since British Columbia announced a closely watched 15 percent tax on foreign homebuyers in the Vancouver metro area. Since then, there’s been a huge increase in interest from Chinese buyers looking toward the Seattle area. It’s impossible to know how exactly that’s affected prices here. But the area most popular with Chinese buyers — in and around West Bellevue — saw a record median price of $2.19 million in August just after the Vancouver tax was announced, before dropping a bit in September. “I’m feeling the pressure of what feels like increased foreign investment, more so than in the past,” Moss said, adding he’s seen more buyers from out-of-state, as well. Overall, the median King County house now costs $538,000, up 9.7 percent from a year ago but down 6 percent from the record prices seen a few months ago. 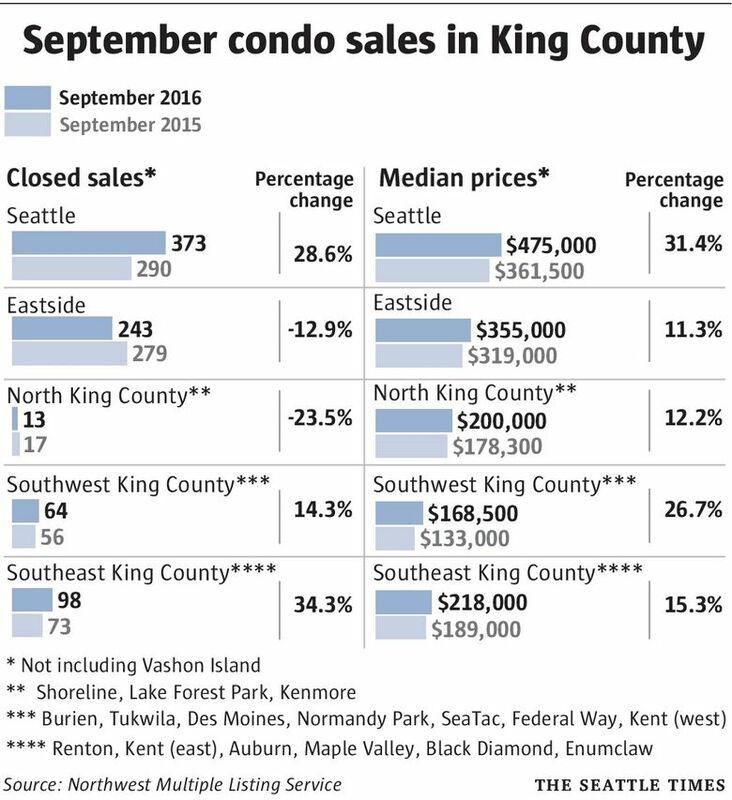 The Queen Anne/Magnolia neighborhood led the way with an annual price hike of 33 percent, followed by 28 percent in the southeast Seattle/Seward Park area and 25 percent in both the Sodo/Beacon Hill region and the Benson Hill part of Renton. But the rest of Renton saw prices drop slightly. Condos, in particular, are seeing prices surge unabated as buyers look for cheaper options. The typical Seattle condo in September cost a record $475,000, up a whopping 31 percent in one year. 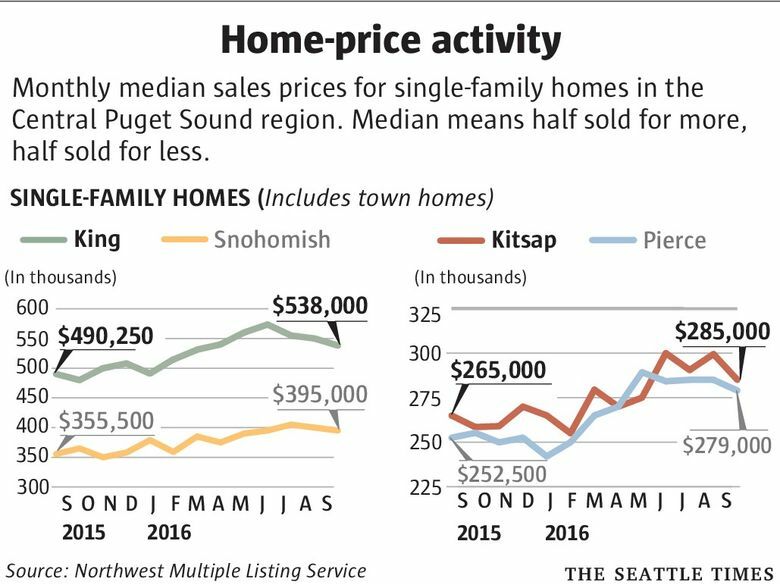 The biggest slowdown in the Puget Sound region was in Kitsap County, where prices rose 7.6 percent from the previous year. The current price of $285,000 is off 5 percent from this year’s peak. Snohomish County led the way on the county level, with home prices in September climbing 11.1 percent vs. a year ago, to a median of $395,000, just shy of the county’s all-time high. Pierce County saw home prices hit $279,000, up 10.5 percent from a year ago and similar to the high points seen earlier in the year.